From providing centerpieces to venue accessories, table settings, stage decor, venue layout, and every other small detail, will help add to the grandeur and ambience to the wedding venue that we can provide. Draping dramatically changes the vision of your event space. To change the color or the appearance of drab, ugly walls…draping has an immediate impact. For example our Dream Star cloth provides a stunning backdrop as the minuscule points of changing star-lights twinkle, or simply stays static. Draping comes in a variety of custom colors ranging from 10ft sizes up to 25 feet high. Trends in wedding stage decoration in Chicago and major wedding scenes revolve around fairytale settings as well as Venetian and Baroque styles. More traditional floral themes are still classic favorites, but many couples also lean towards unique designs that showcase their individual interests. Working with the experts at Dream Occasions offers a great advantage to brides and grooms-to-be, as specialists in stage decoration for weddings offer the easiest access to a plethora of complementary services that will help you turn your vision into reality. Whatever your theme of choice is, mesmerize your guests with a beautifully decorated wedding venue with the help of the best wedding designers in the business. Dream Occasions is the leading wedding planning service in Chicago, best known for staging some of the most elegant and sophisticated weddings in Chicago. 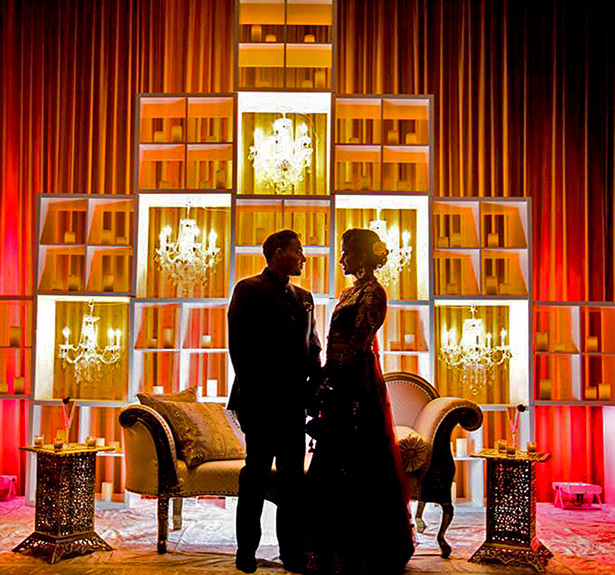 We offer the most comprehensive wedding stage decoration services in Chicago. We ensure professionalism in every aspect of our service, and we enlist only the best wedding designers in the industry. Our team of wedding designers can cater for any and every taste, whether you want a traditional, intimate wedding, or a more elaborate, and trendy, talk-of-the-town staging that will sure to captivate your guests and put them in the best mood for celebration. We work hard to capture the exact things that you want and enhance your ideas with our expert insights. We live to meet and exceed the expectations of each bride and groom that comes knocking on our doors.